Many customers are choosing to remove the EBP system all together for a number of reasons. Some of us just love the beauty of simplicity, others want to cut costs, and still others want to increase performance by removing even the slight restriction of the open valve. Deleting the EBP will set a code, but will not turn on the check engine light. If you've weighed the pros and cons and decided deleting is the way to go, this 7.3 Powerstroke EBPV delete kit makes it easy! 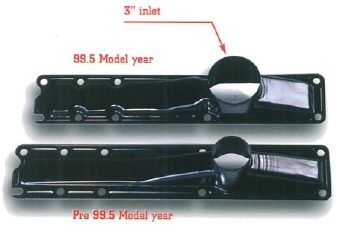 If you own a 1999 truck, it is very important to determine if it is an early or late 1999. This product ONLY fits late 1999's. Many 1999 owners have learned the hard way that going by the VIN or production date is not always accurate. The easiest way to quickly determine if your truck is early or late is to measure the diameter of the intake cover connection. Late model trucks have a three inch inlet, early trucks have a two inch inlet. See figure below.